Some time ago, I posted an official document on this blog concerning a famous Iranian UFO incident, and I would much prefer to confine my words today to the UFO issue. However, since my government has decided to tiptoe with maddening caution (at least publicly) around the situation as many of you fight and die to gain a modicum of something resembling freedom and self-intellect, maybe it's up to little people like me to say a few words in support of your valiant efforts. Most of you are probably much too young to remember the days when the U.S. and Iran were actually on friendly terms, and during that time when the Shah of Iran ruled, many of your people were also dissatisfied with conditions in your country. Still, as I said, we in the U.S. got along with your government. While undergoing U.S. Air Force medical training in the sixties, I attended classes and lab sessions with some gracious young Iranian women, visiting in the U.S. as foreign exchange students, and they were always very cordial and curious and so willing to learn about medical subjects. Later, I served at a pilot training base where many Iranian Air Force pilots learned to fly from the best flight teachers in the world -- American military pilots. It's almost incomprehensible how the relationship between our two countries deteriorated so horribly, though I suppose the fingers of blame can be pointed in several directions. In any case, it has become obvious that you, the youth and future of Iran, want a voice in your country's destiny. Your current rulers certainly haven't demonstrated a concern for much beyond self-serving policies and prophecies. How could you not be upset? How could you not become enraged as you find yourselves denied all to which you feel entitled? As a United States citizen, I wish you success and victory over those amongst you who are determined to hold you back. Always remember that the people who rule and hover over you with an iron fist today can be gone and -- their worst fear -- become irrelevant tomorrow if you stand together. This will sound awfully trite, but -- the world is watching. Good luck. A very intriguing Oklahoma "fish story" surfaced in early 1966, about 2 1/2 years before my Air Force assignment to medical duties at the large Sheppard AFB Regional Hospital in Wichita Falls, Texas. According to an Associated Press report, 56-year-old Eddie Laxton, an electronics instructor at Sheppard, was driving to work on a typical morning from his home in Temple, Oklahoma on U.S. 70 when his journey was suddenly interrupted by a fish-shaped object blocking the highway. This surreal incident, engulfed in early morning darkness, became even stranger when Laxton exited his vehicle and approached the silvery object. Seeing what appeared to be a man dressed in military fatigues, Laxton returned to his auto for a camera, but as he did so the mysterious figure entered the craft and it ascended, disappearing in the darkness. 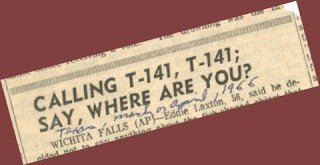 Questioned by the press (the Wichita Falls Record-News took care to assure readers that Laxton was "a calm, stable sort"), the witness insisted the object was not a helicopter because he was familiar with helicopters and the thing he witnessed had no rotors. However, he claimed that it did carry numbers, and though he couldn't see the whole series he believed they began with T141. The electronics expert (former publisher of the Temple, OK Tribune) decided to remain silent about his encounter -- until Snyder, Oklahoma truck driver C.W. Anderson announced that he, too, had observed the craft , and that he and a fellow trucker had, indeed, seen "several" in the past few months. Many bizarre UFO-related incidents erupted during the sixties. Was this another? Is the term, "UFO" even involved here, or was this a secret military project? In the early morning Oklahoma darkness, who knows? If a military man attired in fatigues was present, why would the military find it necessary to park the thing on a highway, inconveniencing motorists while also allowing them a gander at a secret aircraft? No rotors, yet it takes off vertically? The AP report mentions nothing of noise or flame, so one might assume the absence of jet engines or conventional propulsion systems. An Oklahoma highway, it seems, wouldn't exactly consist of prime real estate for frivolously landing, taking off and buzzing about with secret test vehicles. Then again -- the witness's account clearly described a figure in "GI fatigues" and a significant portion of a clearly discernible number on the craft. In the Air Force, of course, I knew pilots who could and would land anywhere, if necessary, Still, if the object looked like a fish and not a bird, one might logically suspect, hmm. . .Navy involvement on an Oklahoma highway? Um. . .
And, remember, the year was 1966. Nowadays, there are so many weird government things flying around that separating legitimate UFO cases from the military what's-its is often a complicated chore, and when one adds deception, deceivers and heightened methods of assuring national security to the mix, well, good luck with that. Ah yes, how we long for the good old cut-and-dried days when a lie was the truth, food wasn't chemically altered and a UFO was a UFO. . .
UFOs? Yes, but let's start here. . .
To varying degrees, I once enjoyed the content broadcast by the three major television networks, especially the news features offered by ABC. But now, the good stuff is so offset by mindless sound bites and dumbed-down "entertainment" nonsense that I can rarely be bothered. If I turn on NBC, I think of endless "green" references, owner General Electric and its quest for profits via windmills and other "green" interests. When I switch to CBS I still curse the network for 1966's debunking feature hosted by Walter Cronkite, "UFO: Friend, Foe or Fantasy," and I will never, ever forgive them for airing that one-sided propaganda clunker. Thank God (or whomever or whatever) for radio, the Internet and any newspaper endowed with balanced reporting. Nevertheless, I felt a tad curious about ABC's two-hour offering, "Earth 2100," a "news special" that aired June 2. According to TV Guide, this "environmental road map to the 22nd century explores possible effects of climate change, population growth and resource depletion." Not too many years ago, in my youth, I was a rabid proponent for the environment. I contributed to green organizations and ardently wrote newspaper letters-to-the-editor sometimes unparalleled in my condemnation of various enviro-abominations as we know them. Ultimately, however, I came to realize the futility of supporting so many intended rightings of so many wrongs. In my mind, I simply narrowed everything down to the one and only issue at hand -- human population growth. No brain surgeons needed here, just an acknowledgment of the overwhelmingly obvious three-ton elephant sitting in the living room. Reduce the international human population drastically and everything else will take care of itself, period. In fact, when politicians embrace green ideals, they generally skip over the too-many-of-us issue -- it just isn't helpful for re-election amongst voters who still believe it's either a right or obligation to fornicate their brains out until the nursery bursts. One way or another, global human population will decline in the future. Whether this occurs easily or harshly depends upon us, but I'm betting we'll choose the hard way and the result will rival a horror story, particularly in the Third World, and possibly in the United States if we continue striving to become the Third World by virtue of kindness, unreasonable immigration policies and charity misplaced. We seldom choose wisely. So -- I tuned in and watched the ABC-TV special, becoming increasingly furious as minutes passed. Why? Was it the encouragement for use of fluorescent light bulbs, the ones containing dangerous levels of mercury manufactured primarily by our Chinese buddies who killed off our pets with poisoned food a few months ago? Perhaps I was steamed because ABC didn't emphasize enough that this was a "possible" scenario of the future, not at all assured. Or maybe it was the fact that "Lucy" and her kin kept making babies in a world so dire that anybody with a supposedly environmentally astute brain would know better than to put even one more child in ecological harm's way. For all her powers of perception about her surroundings and the future, Lucy's insistence upon having a baby instantly stripped her of credibility in my book. Yet, even that couldn't have been the reason for my fury, a degree of anger causing me to nearly shout at the TV like a child frustrated with Barney's PBS antics. Then it struck me, as vividly as watching a corpse murdered by a mob hit ascending in the Hudson River (not that I ever witnessed such a sight, but it sounds visually and dramatically enticing, doesn't it?). For one thing, where was even one hint of the other side of the issue? I mean, look, at last count there were well over 1,000 international scientists sternly questioning the ins and outs of "global warming" and/or climate change, its causes and our influence upon it, and their numbers are growing. Where are their voices on ABC? Where do they appear on any of the major commercial TV networks? Why did ABC feature primarily professors from Harvard, Berkeley and other outlets where such reasoning might be expected? Why were book authors populating only one side of the tracks featured? Was it necessary to scare the hell out of school kids and others with a highly speculative scenario which often bordered upon fantasy? Futurists as psychics or psychics as futurists, take your pick. Maybe we will all terminate in a planetary catastrophe as postulated eventually, but first I want us to examine all sides, as opposed to becoming a convert via forced media electrophoresis. Whoa. Then the huge one bowled me over, the very essence of ABC-TV's two-faced approach. I should have picked up on the contrast from the start. Okay, so ABC did two hours on exclusively one side of a very unsettled issue. Yet, think back to that "UFO special" hosted by the late Peter Jennings, the one where debunkers were consulted as the "other side" to explain away every facet of information served up by UFO proponents. Then recall the more recent rehash of Jennings' report band-aided together by ABC news anchor David Muir. Again, the debunkers cloaked as skeptics ran amuck and had their way with the program. After all, ABC wanted to be fair and include a balance to the UFO issue. Where was that balance during this week's green program? Foul! Time and again, UFO "special" after special , the debunkers are enlisted to kiss away those nasty UFO facts to make the subject appear consistently absurd -- yet, when the ethereal bits and pieces vaguely comprising "global warming" drop upon some producer's desk, a televised one-sided spectacle is whipped up, allowing absolutely no opportunity for the opposing side to participate. Thus, ABC-TV (and it is, by no means, alone in this outrage) clearly wears two faces, and one of them seems destined primarily to treat the UFO subject with ridicule and denial by, indeed, allowing two sides of the issue -- but one side (debunkers) is persistently destined to win out by way of blatantly ridiculous assertions. Anyway, during its bleak glance to the future, there is one thing that ABC neglected to show -- the increasing frivolity, stupidity and irrelevance of commercial television programming as the years go by. If we make it to 2100, I suspect that programs such as "The View" will be little more than freak shows hosted by puppets. Some things never change.